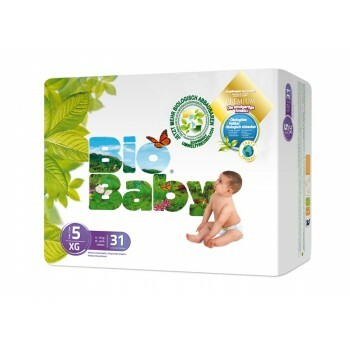 Please note that Bio Baby nappies are sold per box because of shipping purposes. There are 4 packs of nappies per box, please choose your amount of nappies below. Natural High-Tech Absorbent Core – The only diaper with a natural high-tech absorbent core lasting up to 12 hours, so that your baby stays dry and comfortable with healthy skin. Confidence and peace of mind, day and night. Natural Absorbency – The diaper’s core is made using a formula that integrates sustainable materials suzch as cellulose and a super-absorbent gel made from natural ingredients such as starch, meaning it biodegrades in less than a year. Biobaby has been designed based on export knowledge of babies anatomy, so that your baby can grow and develop with the comfort and freedom of movement. That’s why it has: Adjustable fit and comfort; the diaper’s soft waist and elastic ribbon naturally adjust to your baby’s body shape for greater freedom of movement.